** The following article was copied from www.ftc.co. Andy awoke from his nap with a croupy cough. If you’re a parent, you know the strained, barking cough. It’s usually not very serious. The virus causes the airways to swell and makes breathing more difficult. Serious or not, it’s a disturbing thing to hear. A few hours later, we were out at my mother-in-law’s house and Andy had a coughing fit. He struggled to get enough air. With the help of his big brother, we calmed him down and decided to take him to the doctor. Better to go now to the urgent care center than to the ER in the middle of the night. Andy’s a smart kid. He knows what it means to go to the doctor, and he wasn’t too excited about it. He gets that from me. Unless I’m unconscious and therefore unable to protest, just let me be. We loaded him up and drove off with him repeating “Go to the doctor?” over and over. He was okay, but concerned. I assured him the doctor could help. We arrived, checked in, and he saw the first of many amazing sights of the doctor’s office. A family had brought happy meals into the waiting room for their children. I didn’t judge. I’ve done weirder things to keep the peace. Andy loves McDonald’s. “Maybe this doctor isn’t so bad,” he must have thought. We were called back a few minutes later. They asked him to stand on the scale to get his weight. Last time, he refused to do it. I wasn’t there, but my wife remembers the scene well. This night, however, he stood up tall and looked at me with a smile. We entered the room and he jumped up on the table, ready to be examined. A few minutes later, the nurse came in, asked some questions, and took a few initial vitals. I stood by my son, showing him what to do when the nurse asked. “Just put your finger out like this. He’s going to put that thing on it.” “Just be still, he’s taking your temperature.” He did as instructed. I had no idea the whole night was a test of my approval. Andy believed he passed. He did. But he was the only one testing. He had my approval all along. What Andy needed that night more than a trip to the doctor (turned out he was fine and didn’t need any treatments) was the approval of his father. Don’t we all? I know too few men who feel the approval of their fathers. They grow up wondering if they’re pleasing to him. For some, that uncertainty results in rebellion. For others, it results in man-pleasing. In either case, it’s a tragedy. Some sons do disappoint their fathers. But, by and large, I would guess that most sons by the fact that they’re sons have their father’s approval. They just don’t know it because their fathers never say it. They navigate childhood hoping the home-run will bring praise, the A-filled report card will elicit pride, or the diploma will ensure proof of pleasure. They go into adulthood wondering if their job is enough not only to provide for their future family but enough to please their father’s expectations. Are they man enough? Are they good enough? Are they a disappointment? I wonder what kind of world we fathers of young boys could create with the simple words, “I’m proud of you, son.” Those words must not come only after home runs and buzzer beaters or good report cards and graduation. They must come in the mundane, in the doctor’s office and the playroom and at the kitchen table over Sunday dinner. Your influence is more massive than you realize. What would you give to hear your father’s words of affirmation on a normal Saturday evening or Wednesday afternoon? Why hold back with your sons now? Of course, our fathers will fail us and we will fail them. No one is perfect. And it’s also true that our affirmation alone isn’t enough to unleash all the good we wish it could. There is real sin residing in us all. But there is a Father above who approves of us because he never disapproved of his Son. Through his work, we have approval for eternity. If nothing else motivates us–and even if some words are hard for us to say for a variety of reasons–we can look to the words of the Father to the Son, “This is my beloved Son of whom I am well pleased.” Approval flows from heaven and floods this earth in Christ. Let’s advance the tide in our day. 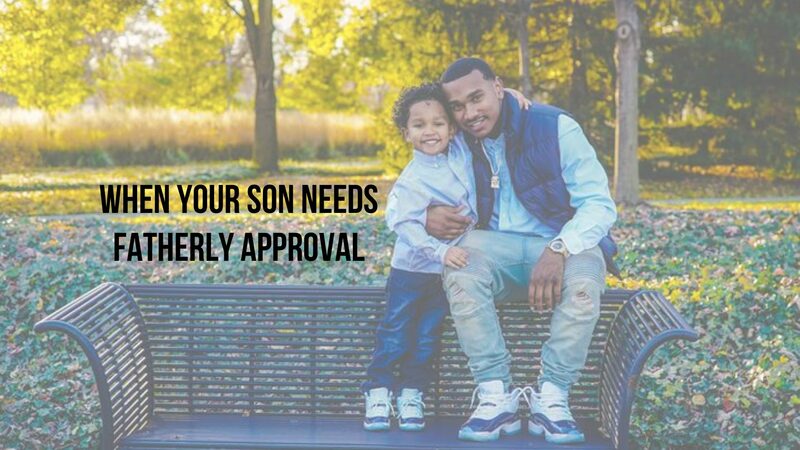 Let’s tell our sons of our approval before it’s too late. I didn’t know Andy needed my approval. I wonder if you know your son needs yours? You have him in the house for a little while, and if he doesn’t know you approve of him now, he’ll wonder all his adult life if he’s ever lived up to your expectations. You have that much power. Use it wisely. David McLemore is part of the church planting team at Refuge Church in Franklin, Tennessee. He is married to Sarah, and they have three sons.